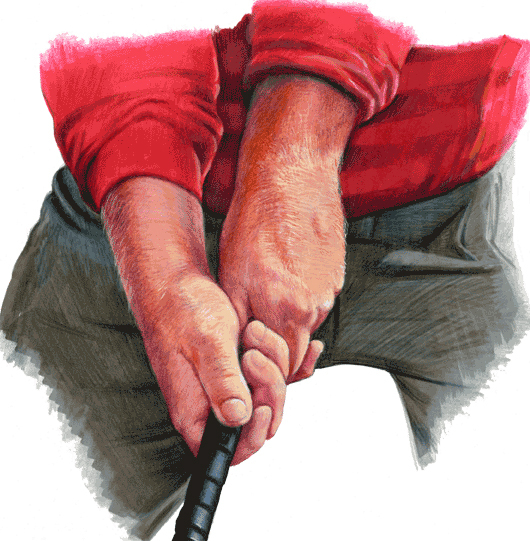 There is much controversy on the ideal way to place the hands on the handle yet there is little debate on the fact that correct club movement is a bi-product of a proper hold / grip on the golf club. Moe Norman’s grip has been a much debated and contentious subject. This debate began mostly after the 1995 Golf Digest article “Moe Knows”, the beginning of Moe’s popularity. Looking at pictures of Moe and video of his golf swing before this article and his meeting with Natural Golf Corporation, Moe held the golf club in an overlapping hand position where his right hand pinky overlapped his left hand index finger. His left hand thumb tucked nicely into the trail hand where the trail palm, covering the left hand thumb, was off of and not touching the grip. This “unification” of the hands utilizes the correct parts of the hands where the club can be held and moved as the hands work together to produce the proper leveraged position and hand speed. All of Moe’s tournament wins and course records were accomplished using this unified overlapping hand position. In 1994, Moe Norman met Jack Kuykendall, founder of Natural Golf Corporation. Kuykendall’s scientific discoveries resembled Moe’s unique golf swing characteristics. It was when Mark Evershed, a well recognized Canadian teaching professional and friend of Moe’s, brought Moe to Jack’s attention. 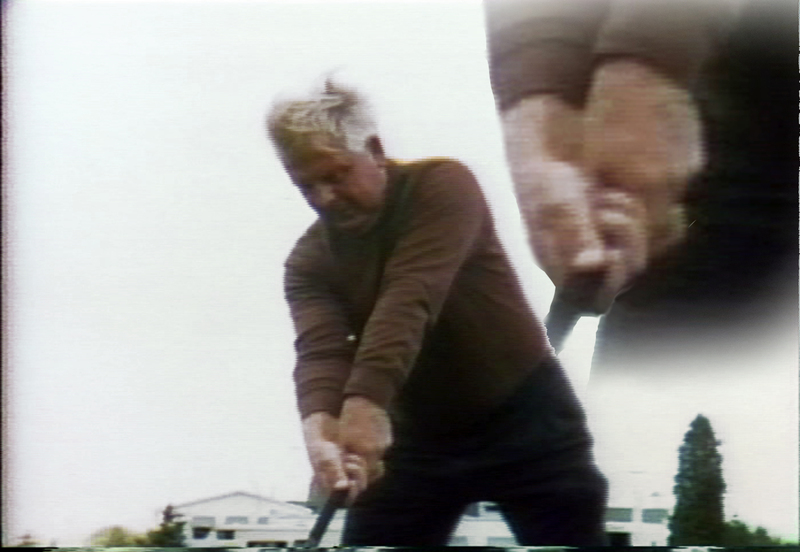 At this point, Natural Golf, under new ownership, began a relationship with Moe however, the company was in the early stages of understanding how the swing that Kuykendall discovered compared to the swing of Moe Norman, the swing that validated the single plane. Natural Golf owner, Larry Olson (1994 – 1997), understood Moe’s uniqueness and began endorsing Moe to promote the Natural Golf methods. Natural Golf was known for selling golf equipment that fit the swing method of Kuykendall. The clubs were long and upright with large non-tapered oversized grips. There was really no science that validated the oversized grip other than Kuykendall’s claim that “If you can hammer a nail, you can become a great ball striker”. Hammers had larger handles than golf clubs and Kuykendall theory applied this analogy to a golf club. The only problem with this analogy is that hammering is only carried out with one hand. Golf is played with two. To strike a golf ball, you add the lead hand into the equation and the trail hand must make room for the lead thumb. This is accomplished by tucking the lead thumb into the trail hand palm. If the grip is too large, there is little room for the thumb. In my time spent with Moe, he often complained that the Natural Golf grips were too large for his hands. Here is a picture of a comparison of Moe’s grip, a conventional grip and a Natural Golf Grip. Pictures of Moe throughout his career show that he played with standard sized grips. The picture indicates that his grip, a little longer in length, is still tapered and approximately the same size as a conventional .580 grip. Why did Moe change from Overlapping to 10-Finger? When Natural Golf met Moe Norman in 1993, Moe was destitute and in need of sponsorship to survive. Influenced by Natural Golf to conform to their teaching methods and convinced he needed to change his grip and promote Natural Golf’s larger grips and longer clubs, Moe altered his grip and his clubs to receive much needed money from Natural Golf. Over the years, Moe has been asked to demonstrate his hand position. In a BBC interview from 1963, when Moe was asked about his hand position he said “Palm and fingers on the left and strictly fingers of the right”. The interview, from 1963, was recorded when Moe was 31 years old and in his prime of playing the game. 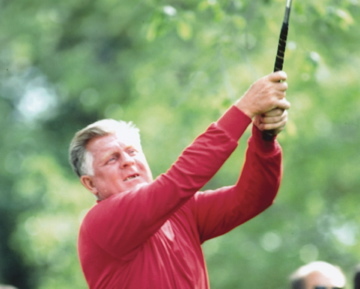 After his influence from Natural Golf in 1994, Moe would often be asked to demonstrate his hand position – exaggerating the palm position of the right hand. You can see in these photos that Moe’s demonstration and the actual hand position are very different.The pictures below show the progression of Moe’s grip position throughout the years. The Picture from 1971 and 1986 show an overlapping position while the picture from 2000 shows a 10 finger position. These hand positions are similar as they clearly show the lead thumb tucked into the trail hand. They also show that the right hand thumb moves across the shaft where the index finger of the hand is clearly in a “trigger” position. The demonstration picture of 2002 shows what Moe would do when asked how he held the club. Influenced to show how he held the club in the palms, he would demonstrate the palm position of both hands. You can clearly see that in these pictures, what Moe demonstrated and what he actually did were very different indeed. You must be careful of pictures and angles when looking at the perfect grip. 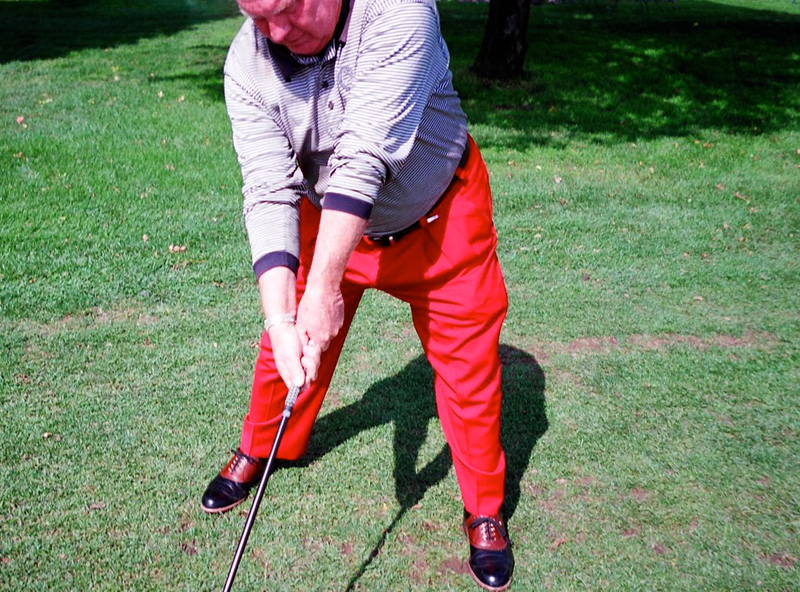 As we discuss Moe Norman’s swing mechanics in the following sections, you will find that the hand positions effect club movement and you will observe, due to a perfect Single Plane hand position, Moe Norman’s perfect club movement.